Lacey is captivating, enthralling, ensnaring, and yet, at the same time, she is elusive and secretive and mysterious. Daniel, like so many others, is caught in orbit around her, brought close when needed but never allowed more than fleeting access to her true self. She manipulates unsparingly, both people and events, bending plotlines to her will. She seeks drama. She insists on being needed and not needing. She is always the center of attention, continuing to draw people in while simultaneously pushing them away. Which is not to say that she is unlikable. Quite the opposite, in fact. Perhaps she has the same effect on readers (or listeners) as she does on those around her. Or perhaps Martin is telling us something, in showing us that we, like others, want her to succeed despite her shortcomings. Or maybe it is that they are not shortcomings at all, but characteristics we can recognize in ourselves. After all, isn't that what makes a strong character? Bottom line: Upon closer inspection, or perhaps closer reflection, it becomes clear that Lacey's story is much bigger than herself; it is a story of New York, of art, and of the constant overlapping and intertwining of the two. Overall, Martin has presented us with a powerful and meaningful story of a person, a place, and an industry, all in one go. It is a story that lingers long after it ends, with threads of ideas and philosophies persisting past the final pages - a story of the very best sort. 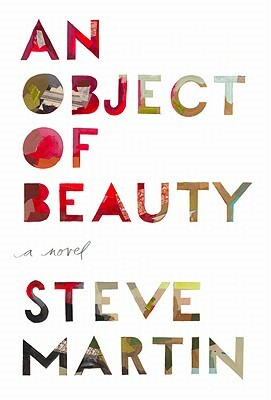 A note on the audio: The audio production of An Object of Beauty is excellent. Though not narrated by Steve Martin, the narrator often sounds like him. It's a nice touch. The print edition, however, includes images of the paintings and installations being discussed throughout the story, which definitely adds something to the reading experience (though the audio stands perfectly fine without them). Many thanks to the Anne Arundel County Public Library for providing both the audiobook and hardcover editions of this book for review. My apologies for needing to renew twice before actually getting around to reviewing. For me, Steve Martin will forever be that guy with an arrow through his head. I cant seem to wrap my head around the fact that he's an author. Softdrink, your comment really, really made me laugh! But having read two of Martin's novels, I have been quite impressed with his work. I have this one sitting on my TBR pile and I can't wait to read it. I'm keeping it for a special moment!